The Great Wall is a masterpiece of construction of ancient China that has also high symbolic value. The stone and earthen fortifications in northern China were built originally to protect the northern borders of the Chinese Empire against intrusions by various nomadic groups. The wall stretches for 8,800km and spans 17 Chinese provinces. 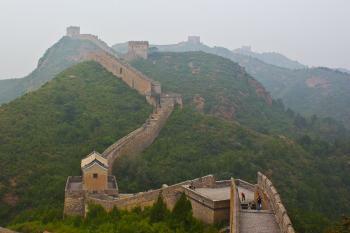 Several walls have been built since the 5th century BC that are referred to collectively as the Great Wall, which has been rebuilt and maintained from the 5th century BC through the 16th century. 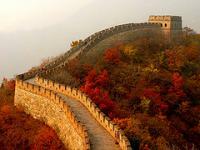 One of the most famous is the wall built between 220-206 BC by the first Emperor of China, Qin Shi Huang. Little of that wall remains; the majority of the existing wall was built during the Ming Dynasty. I visited the Great Wall of China on two occasions: first in 2004 near Beijing and the second time in 2007 near Dunhuang in Gansu Province. To make the first trip, I joined one of the daily 50 yuan tours that start from Qianmen. The guide started chattering (in Chinese of course) right from the start, and didn't stop for the first hour (without breathing, was my impression). Besides me, our group consisted of mainly male Chinese daytrippers. That gave them some interesting photomaterial - themselves and me on various parts of the Wall. Our first Wall-stop was at Juyongguan. I was really happy when I got off the bus: so this is it! One of the most exciting moments in a travellers life. First impression: it's really very steep to walk to one of the watchtowers. And it's a really strange feeling to stand here: like the Taj Mahal, you're so familiar with its looks that you don't know what to think of it. The other stop was at the infamous Badaling-site. Here it's all quite touristy, but not too bad this time of year. They also have a Great Wall-museum where they exhibit (among other not too interesting stuff) the Unesco World Heritage inscription document. A very different experience is visiting one of the wall sections in the outer provinces. There are a few of them in Gansu. On a cold November morning I headed out for the Yumen-pass. Close to that monument of Silk Route fame is a stretch of the Great Wall dating from the Han dynasty. Desert, desert is about the only thing you see here for hundreds of kilometers. And then there's the outline of a wall and a beacon tower. 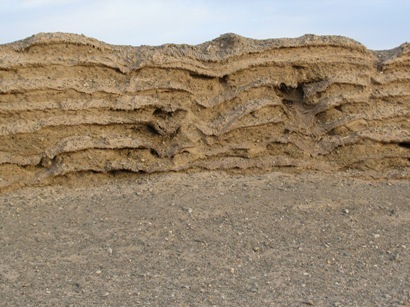 The wall here was made of loess and reed, which has preserved well. 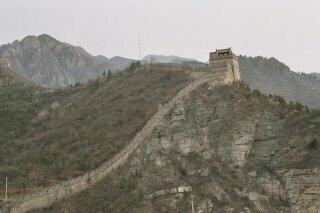 The Great Wall of China is obviously one of the most impressive landmarks ever built by man. But there are lots of ways to visit it and the quality of the experience will vary a lot. 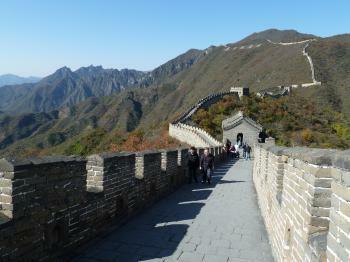 Accessing the wall from Beijing, Badaling is the easiest section but it's also the most crowded. Expect a typical tourist experience. I prefer Jinshanling which is also relatively easy to get to but has a few less tourists because some of the bits are quite hard to climb. What I would really like to do next time is go much further from Beijing to some sections that get only a few visitors. 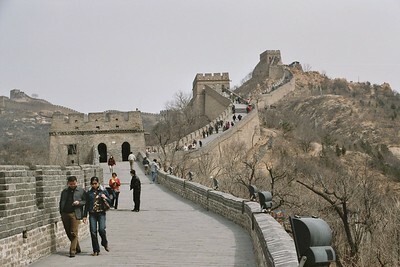 I walked on the Great Wall in December 2010. Beijing's bitter winter made it a memorably cold WHS visit - indeed it is joint coldest in my mind with Denmark's Kronborg Castle, which I visited in a more recent winter. The thing that surprised me the most was just how steep the wall is. I checked-in at the tourist-heavy entrance at Badaling, though in the winter it wasn't overly busy at all. It’s about 90 minutes drive outside of Beijing, and a real contrast to the densely-packed, smog-choked metropolis. I actually visited any part of China north of the Yangtze River the first time only March 2015. I went to Great Wall first, before city sites in Beijing. The section I went to is Jinshanling (www.jslcc.com). Welcome to check the official web site and my photos to determine if you feel like making this where your first experience the Great Wall. Read more from Ziyang here. I've visited the Great Wall on 3 separate occasions. Two visits to Badaling, and one visit to Huanghuacheng. 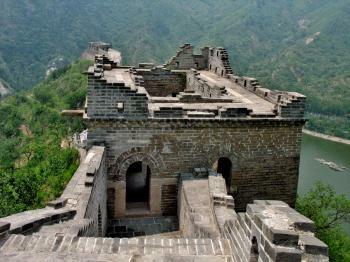 While Badaling is the "tourist wall" it is undoubtedly stunning, particularly if its not filled with people. (weekdays/no holidays, etc.) Huanghuacheng is something altogether different. When I visited in 2007, this portion of the wall was half ruined and after 3-4 hours of hiking the wall, I came across less than 10 people. The degree of incline at this section of the wall is something to marvel at, indeed on a couple occasions I had to practically crawl. While Badaling provided stunning views, Huanghuacheng was an exhilarating experience that I'll never forget. The fact that I had this amazing wonder nearly all to myself is something quite extraordinary. Like some on this forum I would very much appreciate a clarification on what exactly is inscribed concerning the Great Wall world heritage site. I am of the opinion, to inscribe the whole damn thing, and work with China to start suggesting which portion require immediate attention, which areas need management plans, buffer zones, and visitor facilities. a bad thing or a good thing? I visited this WHS and world wonder in October 2013. I opted for the scenic Mutianyu Great Wall since I wanted to avoid the massive crowds of Badaling and because I love to take photos. I went up and down by ropeway and I walked all the way from Tower 1 to 23 (and beyond where the wall is less reconstructed). The golden hour at sunset is incredible since I visited in Autumn and the foliage colours matched the sunset rays on the Great Wall. A magical place indeed! Well it didn't disappoint. This is one of the World Heritage Sites that I always reel off when people ask me what places are included on this list I am so obsessed with. Now after my first visit I can fully understand why this is one of the most famous places in the world. I really enjoyed the 3 or 4 hours I had getting my first stroll along the Great Wall and would love to come back and visit some more stretches of it, especially the remoter parts out west. It is pretty amazing seeing how the wall winds over the top of hills for mile after mile. The topography of the landscape really highlights what an astounding undertaking it was to build such a significant structure, it is impressive just seeing this short stretch and become almost baffling when you take into account just how long it is. I visited as part of a day trip from Beijing, and despite the numerous factory stops and the distinctly underwhelming Ming Tombs I have a really good memory of this visit. I visited the stretch at Mutianyu, which is restored and a little touristy at the base, however the number of people on the Wall proper was very manageable and I even got a few stretches between towers where we were the only visitors. (NB it seems that Mutianyu is not actually listed in the UNESCO documents as part of the inscription, however there are several WHS symbols around the site and on the tickets so I feel I have properly visited this site). Sometimes the context of a visit really adds to it, and here was no exception. The crowds were light, the weather fantastic and my tour also enabled me to have the company of a lovely couple from Madrid, who were happy to pace around the wall with me chatting and handing out some Spanish biscuits making the visit much more enjoyable. I really did enjoy my time here and would happily return to walk some more parts of the wall; the day tours from Beijing can provide a decent chance to get a first taste of it, and also set off thoughts of returning to see a lot more of this huge site. In August of 2006 we visited The GREAT Wall. We took our then 9 year old Granddaughter with us. Climing the Great Wall was an experience of a lifetime. I was only able to walk up 1 mile and then back down. It definitely is a rough walk, but more then amazing! I was impressed by the inscription at Mutianyu, Bijing which said something like " The Wall was once built to keep out people, (awful!) today people of the world come together to wonder at the Wall(awesome!) "
I was lucky enough to spend a week, during which we saw no other European faces, walking various sections of the Ming Great Wall. It is impresive, unfortunately most visitors only go to the, over restored, tourist traps of Badaling and Mutinayu, and so miss the best of the wall. 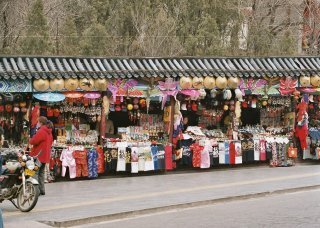 If you can only visit one stretch, then go to the Jinshanling section and walk along it to Simitae. This stretch is also wonderful in that it has been nicely conserved rather than restored. It is also worth considering that the label Great Wall is misleading. It would probably more accurate to talk of the Great Walls (plural) of China. It has been rebuilt on at least three occaisions; Qin, Han and Ming Dynasties, each of which essentially built a new wall, along a new route, often completely different. In addittion the wall is often doubled or even trebled, and has spurs etc. For this reason no one can give an accurate length for the wall. Verdict: To get the best from the Wall, put on your hiking boots. The Great Wall at Ba Da Ling is one of the most common tourist spots in China. The crowds are huge, with its own highway exit. You do get to see other, different parts of the wall on the road there or back, that are more beautiful, or unrestored and therefore more awe inspiring. The climb is quite steep, but not too bad compared with other parts of the wall that we saw from the road. The more adventurous tourist should turn left at the first entrance after buying the ticket, and this has better views and better photo opportunities. There were some in our group that were staying at the Badaling Hotel in order to visit different parts of the wall all week, but I was not keen enough to do that! I took a Grayline Bus tour, and the Chinese lady guide spoke impeccable English. It seems like you went to one of the very touristy portions of the great wall. The wall is thousands of kilometers long, you can go to one of the unrestored portions. Even near Beijing, there are parts that have been relatively unrestored since the Ming Dynasty. For instance, the Simitai is relatively untouched. You can walk along some amazing portions, and camp on the wall itself (or in the towers). WHS enthusiasts might be interested in details of the 2 “extremities” of the Great Wall at Shanhaiguan and Jiayagaun - called by the Chinese “First door under the heaven” and “Last door under the heaven” to indicate the passage away from/to the non-Chinese “barbarian” lands) respectively. As indicated by other reviewers, the sections of the Great Wall around Beijing are very touristy and crowded (particularly with Chinese) and heavily restored. The Government has opened several locations to try to relieve the pressure from the “original” at Badaling and we have visited some of these on different visits. Each is certainly worth going to despite the carnival atmosphere. Like many others before me, my visit to the Ba da ling portion of the Wall was a prepackaged, escorted trip including the mandatory tourist traps. That aside, it truly is a marvel of engineering if only to build on such rugged and inhospitable slopes. Supposedly Chairman Mao said "A real man climbs the Great Wall". Well, that may be true, but I say "A real man may climb the wall, but a smart man takes the tram and walks down." Seeing the beige ribbon stretch out to the horizon does make one appreciate why it belongs on the list. Going to China without seeing the Great Wall would be like going to Paris and not seeing the Eiffel Tower. You just have to do it. Im not sure if this is included in the List but I visited a miniature(and far less touristy) version of the Great Wall in the obscure Chinese city of Taizhou (half-way down south of big brother Beijing!). The locals call it 'Jiang Nan Zhang Cheng' or 'Great Wall South of the Yangtze River'. Its about 6000 meters long and is an exact miniature replica of the Badaling Wall in Beijing. It is said that the wall in Beijing was based on the design of this one. Even for its small size, the steps are astonishingly steep! 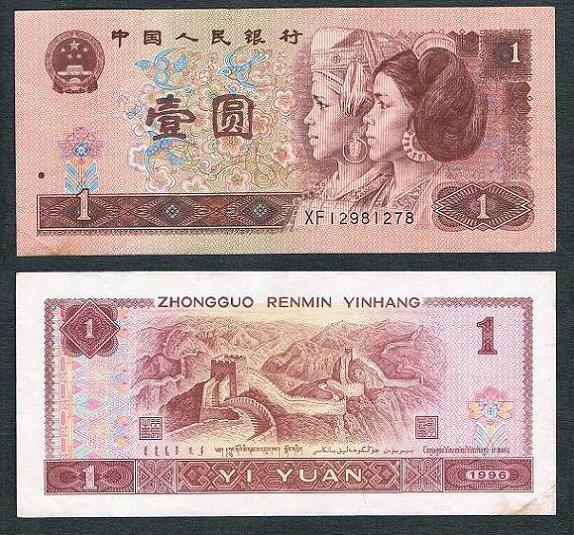 I hope to visit Beijing's version one of these days! I visited Munyungyuan near Beijing, which is 1 of the famous tourist sites for the Great Wall. There are many towers on the wall. You can stand any tower which is at the top of the mountain ridge and feel like the famous Chinese sentence from Qin's King Shin Huang,"Everything was under my feet". My friends and I walked from Jingshanling to Simatai. It was 10km of hard slog, in a 40 degree heat! But, it was worth every step. This part of the Wall is relatively unrestored and is, at times, treacherous. Walking the wild Wall is an experience that I'll never forget. Don't go to the tourist wall, head somewhere like this - you won't regret it for a second. One of the most memorable experiences of my entire life. I went on a school trip to china and we went to see lots of different beautiful places but my two favourate places was the great wall of china and the terrorcotter warriors me and my friend hannah walked the stepist part of the wall it was tiering but worth wile if you havnot been to china i think your next holiday you should be going to china and dont worry about the 10 and a half flite its worth the wait. Drifting Across the Sea: A Record of Ming China: 6th Day, Fifth Month. Fair. "Mt. Chueh was north of the wall, and at its very peak stood Shanhaiguan. It was a strategic point between barbarians and Chinese. The Great Wall built by the Qin general Meng Tian was projected from the waist of Mt. Chueh, passed as the east wall of the garrison, and extended to the sea. In the wall was Tung-men Transfer Station. Everyone going east or west was inspected and allowed or forbidden to pass." Olympic Venues: Men's Cycling Race - Beijing 2008: "After two sweeping right turns in the final kilometer, the final 350m is up a short but moderately steep climb that passes under the South Gate of the Great Wall, which was built in the 14th century, to assure an exciting finale." Mao was here: After climbing a section of the wall Mao reportedly claimed, "You are not a real man; if you haven't climbed the Great Wall." 455 Community Members have visited.